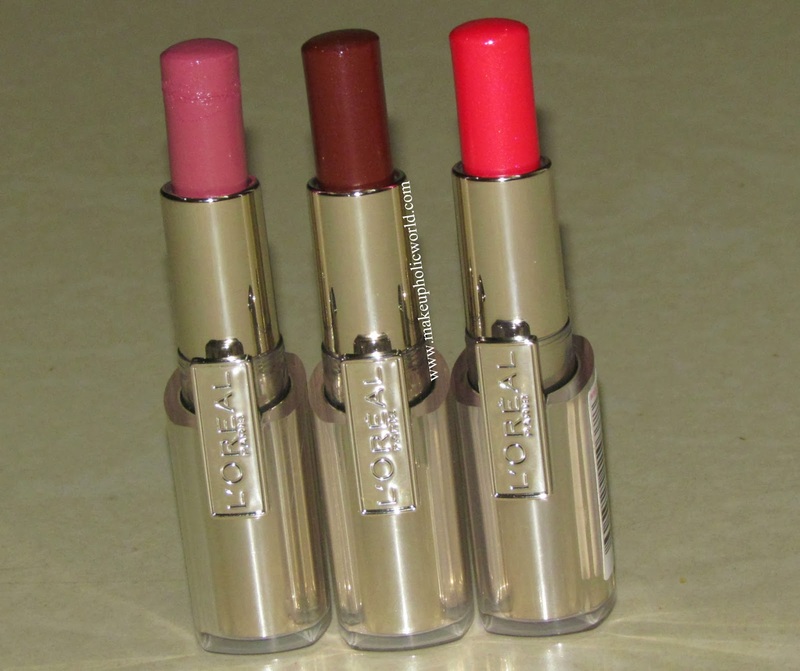 Hello dearies…Today I am going to review 3 lipsticks that I’ve picked from new L’Oreal range. L’Oreal has released their own called Rouge Caresse before 2 weeks here in India. When I first purchased these lipsticks from Nykaa, I hadn’t heard anything about them in the blogosphere, but in the last couple of weeks, I have seen lots of reviews. There are 10 shades which are released in India. here is a closer look of swatches. According to L’Oreal, Rouge Caresse lipsticks have a lightweight formula and soft texture that glides on the lips and gives them luminous shine. The texture is that of a lip balm and its sheer on lips too except for Irresistible Espresso which is the most pigmented out of the ones I picked. In the swatches I have swiped 3-4 times to get that color. The next best thing to be noted about these is the packaging; tube fits snugly around the bullet to prevent the possibility of the lipstick from breaking. The lid also clicks shut very securely. The glossy finish of the lipstick wears away after the first hour, and color fades after 2-3 hours. They also have a light fregrance of candy, but it is very faint…. 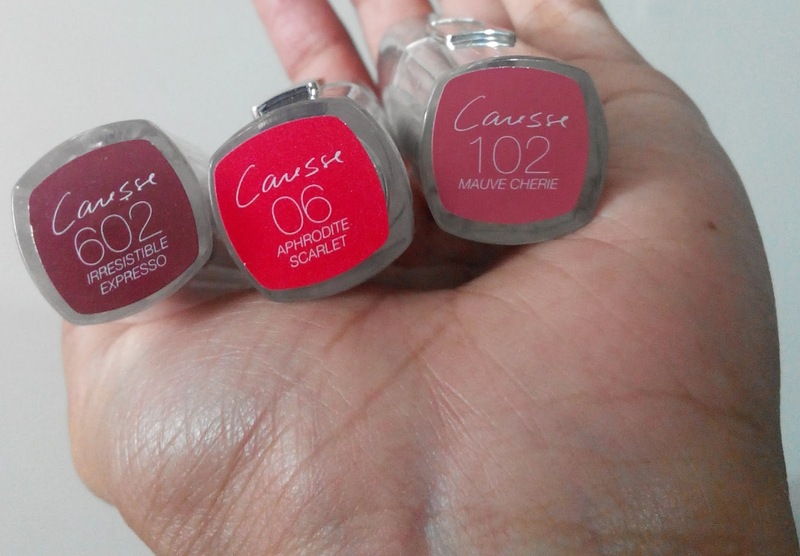 Rouge Caresse lipsticks does not dry out lips – I am hesitant to describe them as nourishing or hydrating, but they definitely do not feel drying to me. Don’t buy this unless you are looking for a lipstick with sheer pigmentation and almost like a lipbalm…I will not buy more shades. Out of the ones I picked, my favorite is Irresistible Espresso. wear time of just 2-3 hours…. Hope you all liked the review. 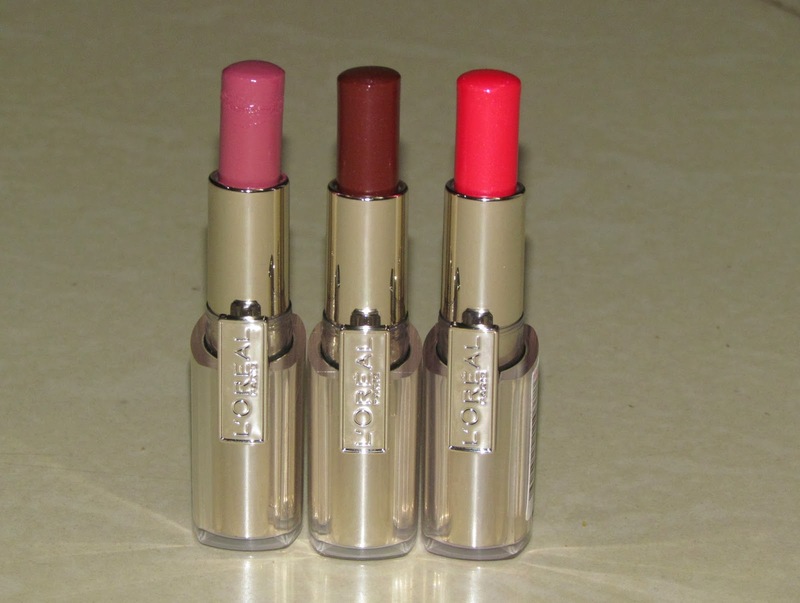 Have you tried L’Oreal Rouge Caresse Lipsticks; What do you think about them…. Nice shades but I won’t pick them up since they won’t work on my pigmented lips!